I almost forgot to report back on the Friendship Bread. I really didn't know what to expect, but we baked it and it was DELICIOUS! 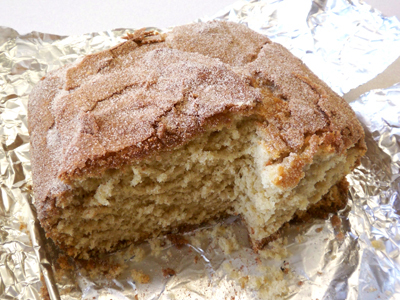 Turns out it is a sweet bread... kind of like a coffee cake. I took the starters to work to give out and everyone was suspicous until they tasted the bread. Joel and Shruti each got one. I had one for Tina or Aprille but another coworker tasted the bread and got it before they did. That's okay, because contrary to what I previously stated... I kept one bag of starter for myself. So in ten days I will have more to give Tina and Aprille. It's that good. Soon we will all have gurgling bubbling bags slowly taking over our kitchens. That looks really tastey! Do you have a recipe for the starter? I"ve been meaning to ask if you are over on ravelry.com yet!! If not, you should be! Does your recipe call for pudding mix? I found it quite suspect that an "Amish" bread would call for such a "modern" ingredient...hmmm. In any case, it was delicious. I remember making this as a kid! It was popular in winter when it rained a lot and we needed something to do indoors often. I remember reading somewhere that you don't actually have to wait ten days. I think a few days is actually supposed to be sufficient. just happens to be called that because the name sounds cute and rustic. My nana used to make this bread. She'd swap out the vanilla pudding for lemon pudding and add poppy seeds to the mix. Just a little idea for you! i was SO skeptical the first time i tried it - but the bread really is sooooo yummmmy. you just have to be a bread believer! aaahhh! that looks so yummy! my tummy's growling just looking at it. you have a really cute blog, btw...my first time here and i had such fun looking through your older posts. everything's so happy and random and cute...nice! rachel - I don't have a recipe for the starter... someone gave it to us... maybe google it? aunti fafa - yeah it used pudding. ysha - that is a GREAT idea! My MIL gave us a bag of starter but we had no idea what to do with it so it went to waste :( Her bread was great though, would love to make my own.